I've found on the internet!" I have collected a huge list of girl slumber party games and activities for your next sleepover! These games also work great as teen party games or tween party games. Blind Van Gogh - Divide players into pairs, and have one of the players in each pair blindfolded. Set a timer for two minutes and show the partner (who can see) an object. The seeing partner then describes the object without saying what it is while the blindfolded player tries to draw it with a pencil on a piece of paper. To make it fair, each team should have the same object. When time is up, take the blindfolds off and let the "artists" see how well their drawing looks like what they were supposed to draw. Board Games - Have some board games handy that everyone can play as a group...such as bingo, Twister, Cranium, etc. Check our our list of great board games to play as slumber party games. Bunco! - A great game that is easy to play if you have enough guests and the space to play it! Cahootie - The classic cootie catcher gets a new twist. Circle Laugh - Lie down in a circle with heads on each other's stomachs and see who can keep from laughing! Drawing Game - Fun slumber party games for players to play in pairs. Find the Leader - The Find the Leader Game is a wacky version of Follow the Leader, where the person who is "it" tries to figure out exactly who is the leader! This party game can leave you scratching your head! Fortune Teller Game #2 - Draw a circle on a piece of paper by tracing a plate. With a pencil divide the circle into 6 sections. In the different sections, write one word in each, such as "Yes", "No", "Maybe", "Probably", "Ask Again" and "I'm not telling!". Then, take turns asking a question and flipping a coin onto the paper to get your fortune! Game Show - Create your own game show with games of Who Wants to be a Millionaire, Are you Smarter than a 5th grader, Wheel of Fortune, etc. Favorite Girl Games - Games that can be used as slumber party games that are favorites just for girls! Glow Olympics - If you are thinking of having a black light party then consider turning it in to an olympic event! Hula Hoop Contest - Who can go the longest? Karaoke - always fun! If you don't have a Karaoke machine, then just do it the old-fashioned way! Simply sing-a-long with your favorite song. Use a pretend microphone. Still fun! Keep Talking - You'll need a bowl full of words written on slips of paper. Words should be things…such as tree, table, traffic light, broccoli, etc., and a timer. To play, have a player pull out a slip of paper, which will be their "topic". Have them talk about their "topic" for two minutes, without getting off-topic! After their two minutes is up, have the next person take a turn! Left Foot Art - Sit on the floor with no shoes and draw using your left foot. Light as a Feather- Are you light as a feather or stiff as a board? A classic!! Limbo - How low can you go? If you don't have a limbo stick, use a boa or a flashlight beam! Mad-Libs - Always a hit. M&M Hunt Game - Everyone loves M&Ms and everyone loves scavenger-type treasure hunts for slumber party games! One of our favorites! Makeup Artist - You'll need makeup: lipstick, loose powder and blush. Stay away from things that could injure an eye, such as eye shadow (unless applying with a cotton ball) and no mascara (too scary to try to do!). Divide players into teams. One player is the model, and their teammate is the make up artist. The makeup artist has 2 minutes to put makeup on their model. But must do it blindfolded! The other players who aren't taking their turn can give out directions on what to do such as "higher, lower, over to the left," etc.! Mosquito Game - This is great to play at a camping themed slumber party, but is so much fun we thought we'd include it on our master list. Give each player a sheet of dot stickers (preferably red!) that will represent mosquito bites. Throughout the evening, try to get rid of your stickers by giving the others players & mosquito bites! Do this by secretly placing stickers on other players. Be careful...if you are caught you have to keep your mosquito bite sticker. The first player to get rid of their stickers is the winner! Murder Mystery - Before the party, cut a slip of paper for each guest. On one place an X, and on another write Detective. All other slips of paper should be blank. Have everyone draw a slip of paper, with only the player who draws the detective slip telling the others that he is the detective. Whoever draws the "X" will be the murderer. The detective will leave the room. Turn out the lights. The players move about the room, and the murderer will give someone a big hug to "murder" them. The victim counts to 10, and then screams, falling down on the floor "dead". (Counting to 10 gives the murderer a chance to get away). The detective comes back in the room and can question all the "living" players until they find the murderer! Observation -You'll need: one different small item per person (a paper clip, safety pin, sticker, bandaid, or anything that can stick or be fastened on). Secretly give each player an item. Have them hide it somewhere on themselves, but in plain sight. Give everyone a list of the items that you handed out. Then, have everyone go around and try to locate the items. Whoever has found all the items first wins! Old Maid - Think of this one as a real-life version of the popular card game. Once Upon a Time - Sit in a circle and let the host tell a story. They'll start with a sentence to get the story rolling. Then the next person in the circle will tell what happened next in one sentence. Go around the circle 3 times to complete the story! (with a small group you may want to go around the circle more times than that)! Pass the Hat - Play the old Pass the Orange game, but with a hat. Pass the hat from head to head without using your hands! You can pass all sorts of sleepover related objects as slumber party games, such as a teddy bear. Photo Fun - Divide players into teams, with each team using a digital camera. Give each team a list of photos to take. Some ideas are...the team pretending to sleep, of the team dancing, of the team doing yoga, etc. Whatever you can think of that will make a crazy photo! Make sure the different players take turns being the photographer so everyone gets a turn to be photographer and models! Pick Up Sticks - This is a fun game to play, and if you don't have enough sticks (or want several sets...) you can use colored drinking straws. Pillowcase Hop - Have a sack race but use pillowcases for fun slumber party games! Pillow Tag - To play tag as one of your slumber party games, you tag someone by hitting them with a pillow. Printable Games - Fun games to print out and fill in at your party in holiday themes or birthday themes. Scavenger Hunt - Here are some tips to planning a great hunt in include as part of your slumber party games! Shadows - Use your flashlight to make shadows on the wall with your hands in the shapes of animals, faces, etc. Silly String Fights - Anytime you get silly string involved, it is fun. Get a can (or two) for everyone, send them outside and have at it! Sleeping Bag Hunt - Before the party, gather objects (such as a magazine, stuffed animals, a shoe). Have one object assigned to each player. Have players leave the room while you hide one thing inside each sleeping bag. When players return have them try to figure out which sleeping bag has their item. No peeking, but OK to touch. Perfect for slumber party games and sleepovers. Sleeping Bag Race - Line up the sleeping bags, have each person climb inside one, and race across the room by wiggling inside the bags. Slumber Party Box of Questions - just one of many slumber party games you can purchase that are made specifically for slumber parties. Sock Bounce - You'll need a different pair of colored socks per player (hey...this could be a party favor!). Roll the socks up into a ball. You'll also need a bed sheet. Have everyone hold an edge of the bed sheet, with the rolls of socks sitting on top. Everyone lifts up the sheet together, shaking and waving the sheet (like a parachute game). The object is for each player to try to bounce the other socks off the sheet, and avoid letting the socks get bounced off! This is great played as slumber party games because then the socks can be worn afterwards and be part of your party favors. Sock Hunt - You'll need a pair of socks for each player. Before the party, take one sock from each pair and hide it. Then, at the party, give the mate to a guest and have them find the hidden sock that matches. You can even hide a little prize in the sock that you have hidden such as nail polish and gloss. Suitcase Relay - There are many variations of this played as slumber party games, and you can use your imagination to make it as crazy as possible for your friends. Talent Show - Let everyone (who wants to) participate in a talent show! Be sure to video this one and replay later during the slumber party. Teen Party Games - Our full, giant list of teen party games and teenage birthday party games. Ticking Clock Game - Have players leave the room (or hide their eyes) while you hide an alarm clock in one sleeping bag. At some point in the evening, have the clock set to go off. Tell your guests that the alarm will go off, but don't tell them when it will go off - that will be a surprise). When the alarm rings, whoever can find the clock first wins! Tongue Twisters - That's right. Tongue Twisters. Peter Piper picked a peck of pickled peppers. That sort of thing. Find a list of tongue twisters and try saying them. Can be really funny! Toothpaste Test - Anyone really going to bed? If so, have a toothpaste taste test. Furnish two to four toothpastes for everyone to get to try and then let everyone vote for the best one. Treasure Hunt - Find a treasure hunt that will challenge you and your friends! Truth or Dare Isn't this what you immediately think of when someone says "slumber party games"? It is played at many slumber parties at some point. To keep it tame (and fair), write up a group of "truths" and "dares" ahead of time and people can pick from their fate from bowl. We have a list of clean truth or dare questions, as well as some dare ideas! More Truth or Dare - You can purchase truth or dare games with all the supplies, dares and truth questions you need. Truth is Stranger than Fiction Game - Are those celebrity stories too crazy to be true? Maybe...maybe not. Can you tell the difference? This is how those rumors get started!! Can be played as slumber party games or for any party. TV Voices Game - Before the party, make recordings of the voices of TV characters. At the party, listen to the recordings and have everyone try to guess who they are hearing. Twister - Another one of the classic slumber party games! Who Am I? Game - A fun game for large or small groups. Have A Great Slumber Party Game? Do you have a great sleepover game or activity? Share it! You take pillows and throw at each other. It's a fun game but make sure all things breakable are put away! Get one of your friends to put a blindfold over their eyes and do some make up. Scare your mom or dad at the end! At your next slumber party try makeover pop: Turn on some music get blind folds and as the beat is going put on makeup. Click here to read more Visitor Submitted Slumber Party Ideas. Go from Slumber Party Games to Slumber Party Theme Ideas - The source for slumber party theme ideas, slumber party locations and site visitor ideas! Sleepover Party Food - We've gathered a list of favorite slumber party foods to help you plan your menu! Sleepover Party Crafts - Fun, easy and popular ideas for sleepover party crafts. Slumber Party Movies - Movies and popcorn make the slumber party! We've listed some of our (and our visitors) favorite slumber party movies. Hotel Sleepovers - Becoming more and more popular all the time, we'll give you tips on how to have the best hotel sleepover party ever! Party Invitations - Looking for the perfect Slumber Party invitation? We've rounded some up for you! 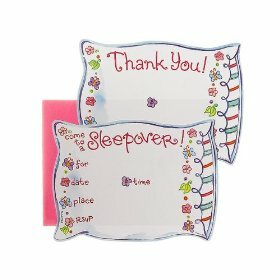 Slumber Parties Supplies - Invitations, Decorations, Favors and more! 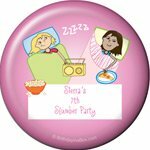 First Slumber Parties Planning - Is this your first slumber party? We'll help you plan it! Adult Slumber Parties - Big girls want to have fun too!